I started at the WLA in January as an undergraduate volunteer intern and was very happy to be asked to stay into this summer as well. I am now going into my senior year and my work in the archive has taught me a lot about how history can be much more recent than I may have once thought. 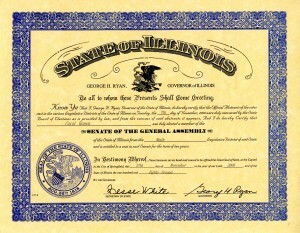 For the past several months I have been working on processing a collection from the Cook County Treasurer, Maria Pappas. Maria Pappas has been a part of Cook County government since the early 1990s and started off that Cook County-based career with a PhD in counseling and psychology from our very own Loyola University Chicago. Pappas’ longevity in office has been documented not only in news articles, but in TV and radio appearances, which, wouldn’t you know it, have been preserved on VHS, a novelty for this 21 year old intern. Like many bygone technologies, like the CD player, Walkman, Nokia phones, and even an original iPhone, I thought VHS and audio cassettes were a thing of the past that would never cross my path again. Imagine my surprise when the first box that I went through from Maria Pappas’ donation contained nothing but VHS tapes, and not only that, but they were still watchable! Although I knew what archives involved, in my imagination it always meant that I would be carefully handling decades, if not centuries old, journals and pictures. With this idea in mind, going through VHS tapes and CDs, objects from my childhood that now seem far outdated, has shifted my perspective of archives, and of history as a whole. 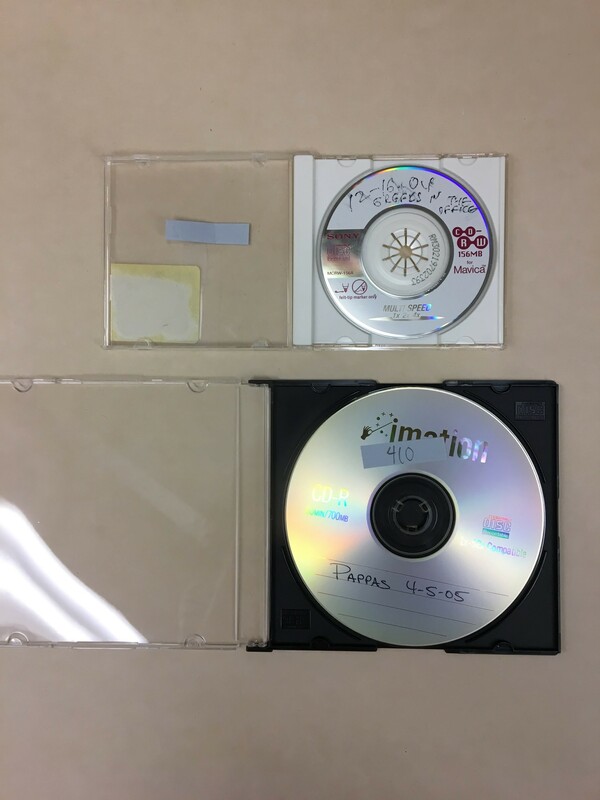 With Maria Pappas’ progression through her career, the technology used to preserve her experience also progresses and changes, shifting from U-Matic tapes, cassettes, and VHS to CDs and MCRW discs. Being able to physically see a progression of time, not only in the contents of these media forms, but also in the media forms themselves adds another level to the understanding of how quickly history and technology can change. 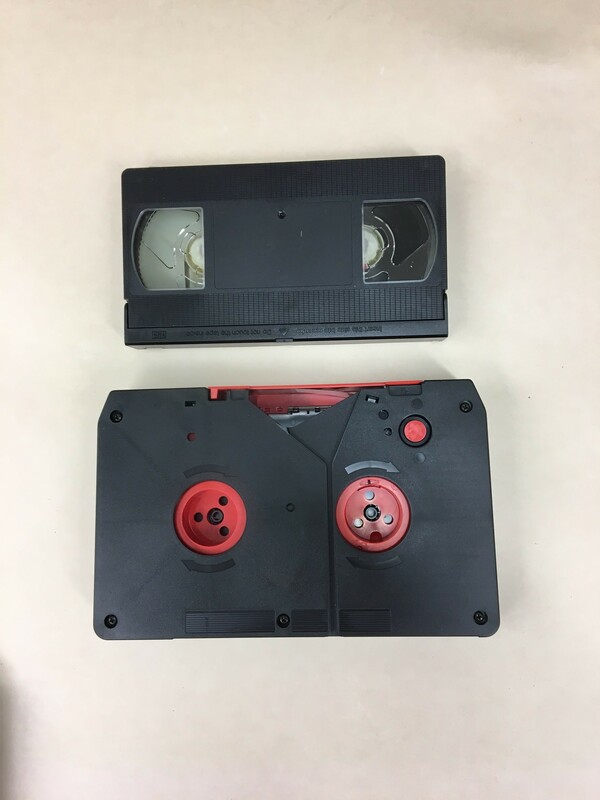 Most notably, it was surprising to come across technologies in the Pappas collection that I knew nothing about, like U-Matic tapes and MCRW discs. These technologies evolved and became outdated quickly, and were used in such small niches that their usefulness was quickly replaced by another form of technology. Media found in the Maria Pappas papers. With the physical evidence of the longevity of Maria Pappas’ career in front of me in these different types of multimedia, actually going through the documentation and reading about her career and outreach programs over the years made the extent of her career seem more emphasized. Maria Pappas began as a member of the Cook County Board of Commissioners in 1990, then ran for Cook County Treasurer in 1998, a position she has held since then, and is the current incumbent for. Maria Pappas is credited with reorganizing the Cook County Treasurer’s office, which had been losing checks and improperly documenting interactions and notices for years before Maria Pappas was elected to the position. After organizing the Cook County Treasurer’s office, Maria Pappas began her Treasurer’s Outreach Program and Services, in which she published property tax brochures in several languages and reached out to many different cultural communities in Chicago and the surrounding areas in order to make property tax payment information more accessible. Cook County is an incredibly diverse area and one that has $12 billion in property taxes collected annually. With this diversity in mind, Maria Pappas has ensured that she has efficiently informed all of the community members, displaying her understanding of the importance of progress and helping people in what some may see as atypical ways. Her impressive career and record is well documented, on paper, on VHS, and online, displaying the progression of a well-rounded career, as well as the advancement of technology and the advancement a community along with that career. 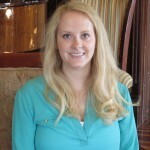 Amela Kalezic is an intern at the WLA and has been working with the Cook County Treasurer, Maria Pappas’ collection. She is an undergraduate majoring in History and Environmental Science at Loyola and is an avid dog lover who sadly does not have one of her own yet, but will not let you walk past a cute one without letting you know. With the weekly primaries and Super Tuesday right around the corner, I have the 2016 Presidential Campaign on the brain. 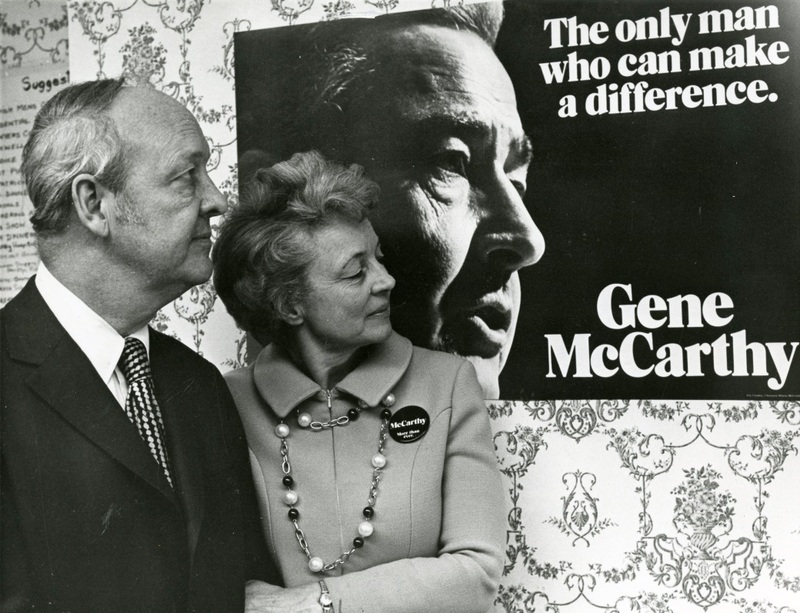 As advertisements play on TV and friends on Facebook voice their opinions, I am reminded of Patricia Caron Crowley and her family’s work campaigning for Eugene McCarthy during his bid for President in 1968 and 1972. Her collection illustrates the strong involvement of a woman in campaigning for a Presidential candidate. Crowley hosted parties and luncheons with her husband and kept a significant amount of newspaper articles and memorabilia from the campaign trail. 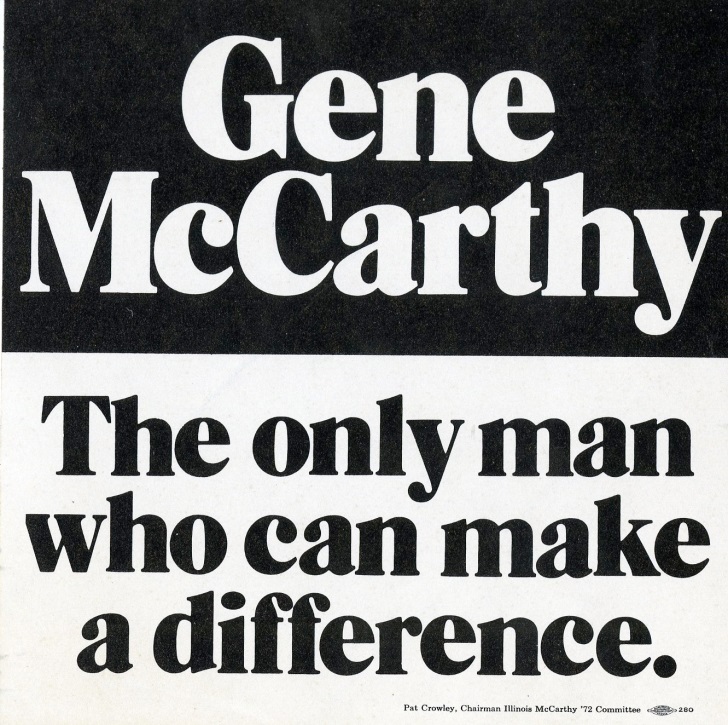 Patricia and her husband Pat were ideal candidates to run McCarthy’s Illinois campaign because of their previous experience organizing and raising funds for various organizations. 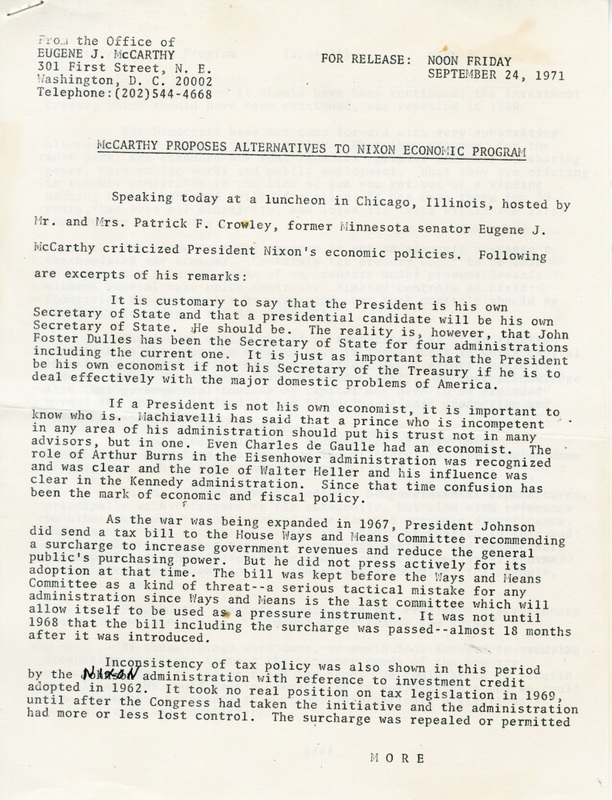 The Crowley’s also had connections with Chicago politicians. 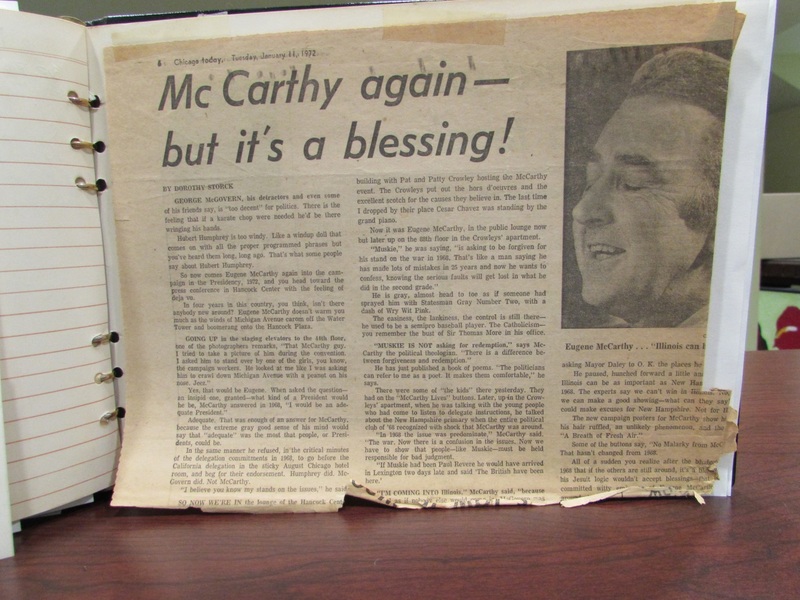 While McCarthy never made it to the White House, Patricia’s collection at the Women and Leadership Archives highlights the hard work and effort that goes into campaigning and politics. Campaigns can be very visual from the TV advertisements, newspaper articles, and yard signs to how a candidate holds himself/herself or what he/she is wearing during a debate. 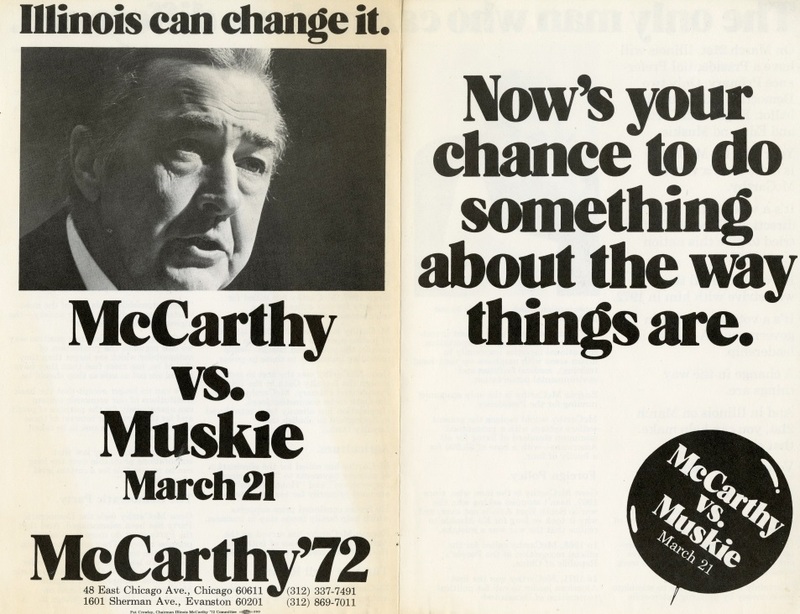 Below are some of the images and visual materials used in the McCarthy Campaign. As you view the images, think about how political advertising has changed and how it has stayed the same. The Crowley’s were a well-connected and well known family in Chicago. How is their support similar or dissimilar from celebrity endorsements today? 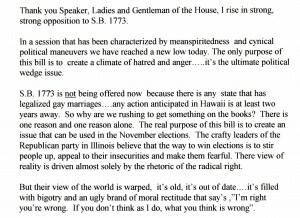 There are many things that have not changed in the 44 years since the 1972 election but those things that have changed are important for understanding current political thought and the priorities of the American public. A personal favorite from the Patricia Caron Crowley collection at the WLA is this white and blue campaign hat for McCarthy. 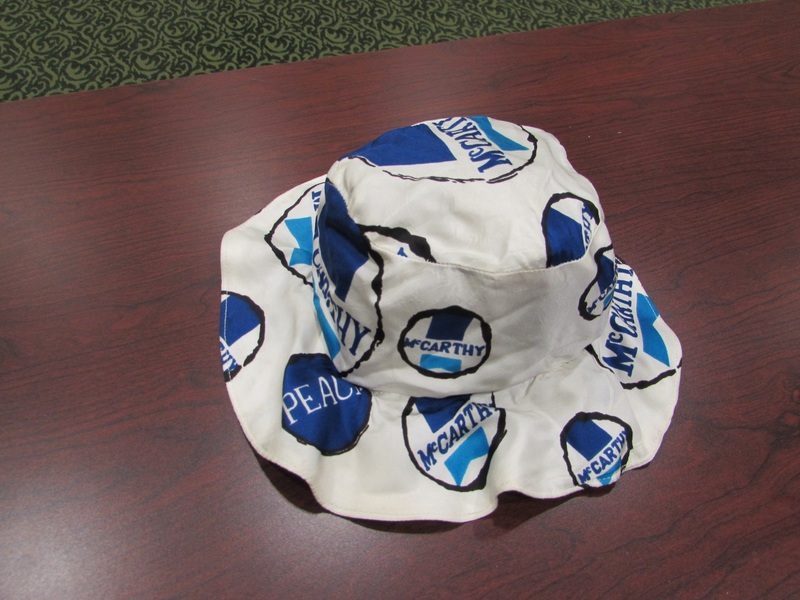 The hat includes the word “PEACE” as McCarthy was referred to as the peace candidate in reference to his thoughts on the Vietnam War. Megan is a Graduate Assistant at the WLA and is in the first year of her M.A in Public History at Loyola University Chicago. 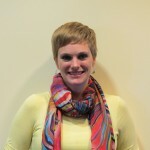 She is an avid movie-goer and enjoys arts and crafts, live sporting events, and small Midwestern towns. HERA began in 1973 as an Illinois organization comprised of homemakers in support of the Equal Rights Amendment (ERA), a constitutional amendment originally proposed in 1923 that would give women equal protection under the law. Reintroduced and passed by Congress in 1972, the amendment then went on to the states for ratification. The name of the organization, originally Housewives for the Equal Rights Amendment, was consciously chosen as a reaction against the argument made by some that the ERA threatened homemakers. 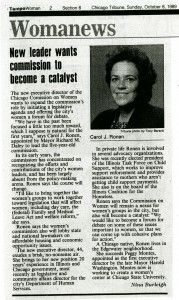 Advocating for the measure both within their communities and on the state level, HERA soon grew to a national organization with chapters across the country. Although all HERA members self-identified as homemakers, participants had a range of backgrounds and educational, volunteer, and professional experiences. The majority belonged to other national or community organizations where they held positions as secretaries, presidents, and vice-presidents. 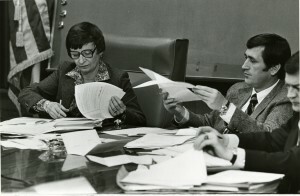 In 1979 HERA change its name from Homemakers for Equal Rights Amendment to the Homemakers’ Equal Rights Association and the organization shifted its focus beyond the Equal Rights Amendment and began advocating for the legal rights and full recognition of homemakers. HERA members with IL Governor James Thompson, May 1982. HERA coordinators and members often faced a great deal of criticism from those who derogatorily considered it a feminist organization. 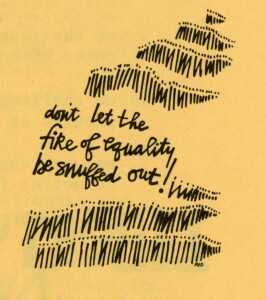 A hot topic at the time, the designation as feminist was accepted by some members and strongly rejected by others. Regardless of whether they considered themselves feminists or not, however, members understood their efforts as contributing to a national movement. Following the defeat of the ERA in 1982, there was vocal concern about the future of HERA and if the organization still had a purpose. HERA began to recast itself as a professional organization for homemakers, an association with goals to lobby in the interest of homemakers and their families. Acknowledging the changing purpose and goals of the organization, in 1984 the name changed once again—though the acronym HERA was retained—to Home, Equality, Rights, and Access. Ultimately, however, HERA was not able to survive of defeat of the ERA and the organization dissolved several years later. The Homemaker’s Equal Rights Association Records at the Women and Leadership Archives consist of 2.75 linear feet of materials spanning the years 1971-1987. Also see the Beth Brinkman Cianci Papers. 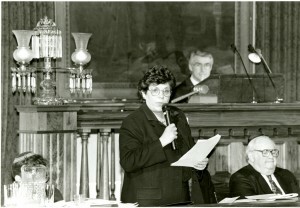 Cianci served as a national board member for HERA from 1979-1983. 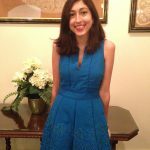 Laura Peace is a 2014 graduate of the MA in Public History Program at Loyola University Chicago and a former WLA Graduate Assistant. Carolyn Farrell after being elected to the Dubuque, Iowa City Council, 1977. 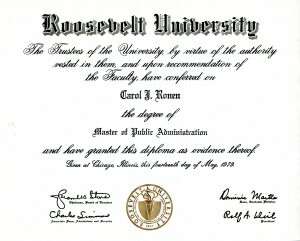 Carolyn Farrell, B.V.M., was born in Des Moines, Iowa in 1934. In 1953 at the age of 18, Farrell joined the Sisters of the Blessed Virgin Mary (BVM), taking her final vows in 1961. She received her B.A. in History from Clarke College in 1966 and went on to attain a Master’s of Science in Education Administration from Western Illinois University. Farrell also completed post-graduate work at the University of Iowa in Administration of Higher Education and at the Hubert Humphrey Institute for Public Affairs at the University of Minnesota. After holding positions as a teacher and administrator for a number of years, in 1974 Farrell began serving on several public committees in Dubuque, Iowa. 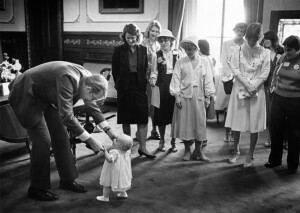 It was during this time that Farrell realized she wanted to become involved in politics. 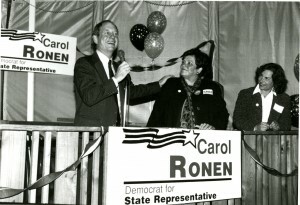 She ran for Dubuque City Council in 1977 and became the first woman to be elected for a four year term. 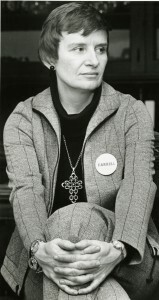 In 1980, Farrell was elected for a one year term as the Mayor of Dubuque, becoming the first woman religious to serve as a mayor of a city in the United States. The following year Farrell returned to her former position as the Director of Continuing Education at Clarke College, a position which she held until 1988. In 1991, Farrell accepted the Interim Presidency of Mundelein College in Chicago where she oversaw the College’s affiliation with Loyola University Chicago. Farrell went on to serve as Associate Vice President of Loyola University for Mundelein College and Associate Vice President and Director of the Ann Ida Gannon, BVM, Center for Women and Leadership. Farrell retired from Loyola University Chicago in 2006 and continues her work as Director of the Roberta Kuhn Center at the BVM Motherhouse in Dubuque, Iowa. Carolyn Farrell as Mayor of Dubuque, Iowa, 1980. Farrell’s election to office and her service to the field of higher education is a testament to the drive and influential capacities of both women and women religious. Her prominent place in Women’s History is reflected by her attendance at the United Nations 4th World Conference on Women in Beijing in 1995. The Carolyn Farrell, BVM Papers at the WLA consists of 13 linear feet and document Farrell’s professional life with the majority of her papers spanning from 1977-1996. Additional papers at the WLA of women involved in politics include the Carol Ronen Papers, the Sheli Lulkin Papers, the Mary Ann Smith Papers, the Marion Volini Papers, and the Carol Mosley Braun Papers (currently unavailable for research). The WLA also has the papers of over a dozen BVMs and 25 women religious or former women religious. See our website for a full list of these collections. Dubuque, Iowa operates under a council-manager form of government, whereas the mayor is elected by the city council from among its members.